Just over two years ago, when I was starting to make graphics for this blog, I made one called Comparing Book Covers, where I looked at my favourite books of the time and the foreign editions I loved the look of. Click on the image for an enlarged version! I love books with brush fonts on the cover, as I think they’re really pretty, so that’s probably why I was so drawn to most of these. Another thing I love to see with book covers is how an artist interprets the theme of the book – for What We Left Behind, an LGBT* romance story, the English edition incorporates lots of small gender symbols, whilst the Australian version is a colourful rainbow. And with Beautiful Broken Things, the French edition’s cover design is a nod to a pivotal point in the story, and I think it’s presented really cleverly. What books have you read recently, and do you have a favourite cover? This entry was posted in Infographic and tagged beautiful broken things, book covers, books, emma donoghue, robin talley, room, sara barnard, what we left behind on July 6, 2016 by Gee. I hope you had an awesome Christmas and/or holiday! In 2014, I made a huge infographic of my favourite reads of the year. It took ages, and I read a ridiculous amount last year, so that list was pretty big. I like summary posts, and I thought – why not write about just my top fifteen books of 2015? 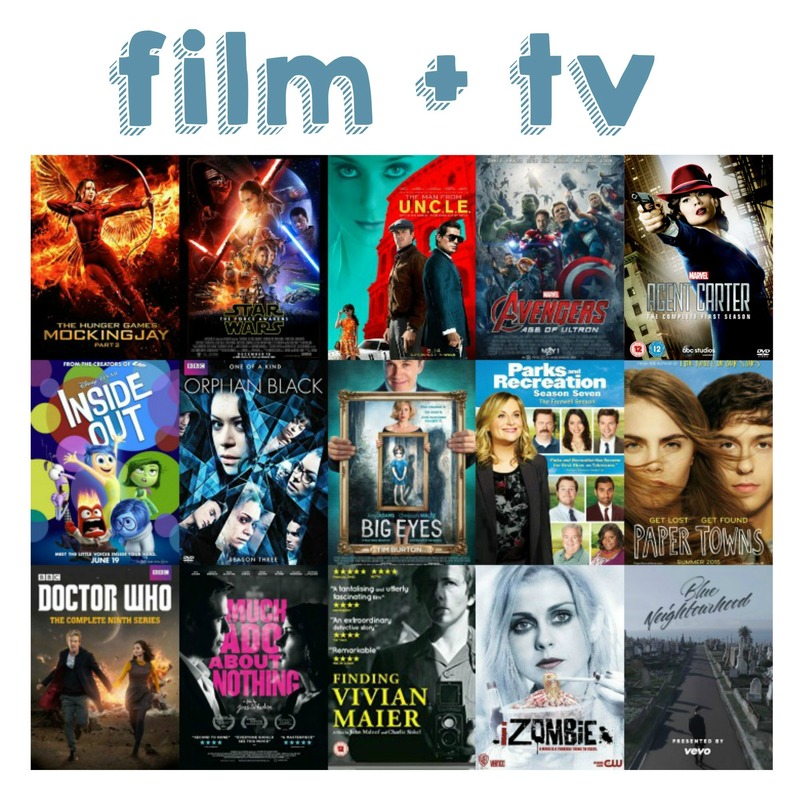 And, while I’m at it, why not throw in some other things too… So here’s a post of my top fifteen books, albums and movies/tv series of the year! Most of the things mentioned in this post are relatively new (out this year) but some are recent discoveries I’ve made. Have you enjoyed any of the things I’ve mentioned above? What’s been your favourite discovery of this year? 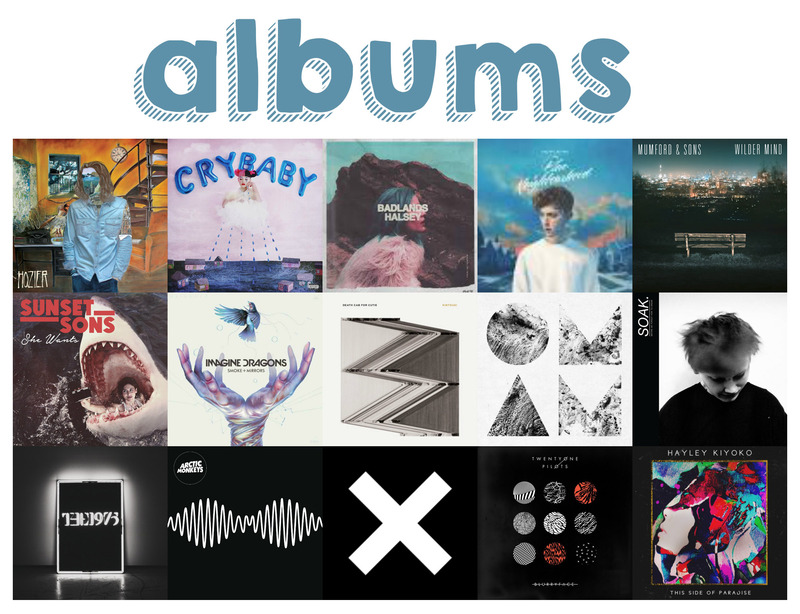 This entry was posted in Discussion and tagged 15 in 15, 2015, albums, books, films, infographic, lists, movies, music, reading, summary, tv series, yearly summary on December 30, 2015 by Gee. It doesn’t feel right to be sitting down at my laptop right now, condensing all the great things that have happened this year into one blog post. This year has been one of the most important ones of my life so far, and so many great things have happened. It’s all flown by! Here’s a few highlights of my year, bookish and non-bookish. I did a similar post last year and would like to make it an annual thing, as it’ll be nice (or embarrassing? I always laugh at my old posts) to look back on these in the future. 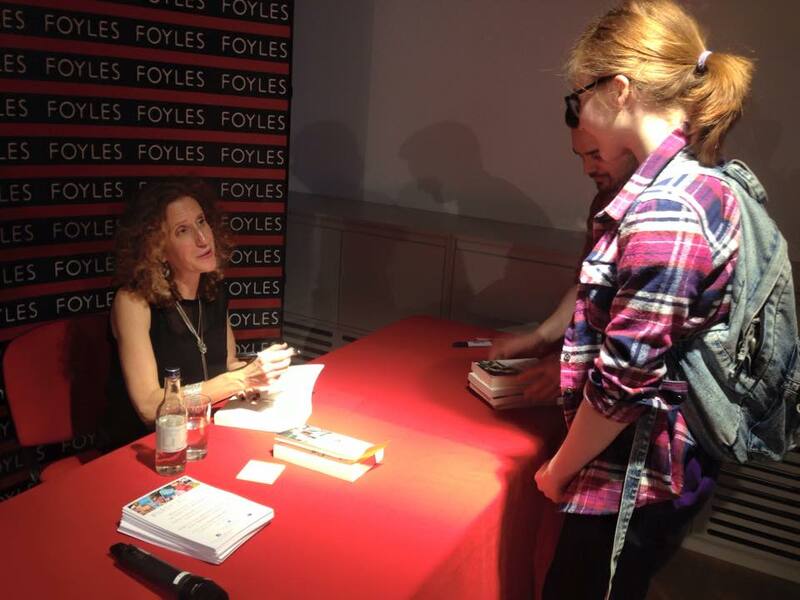 One of my favourite bookish events happened in this month – I was lucky enough to get tickets to a talk by Gayle Forman at Foyles when she visited the UK promoting I Was Here. I really admire Gayle’s books so it was a fantastic opportunity to meet her. I took early entry exams in this month in science, PE and ICT. I was freaking out about them for months (except for PE, which I had… a week’s notice for. Thanks school) and all but one of the five exams were in one week. It was terrifying, considering this wasn’t near as many GCSEs as I’ll be doing next year. However, I’m really glad I took them early and got passing grades in them. 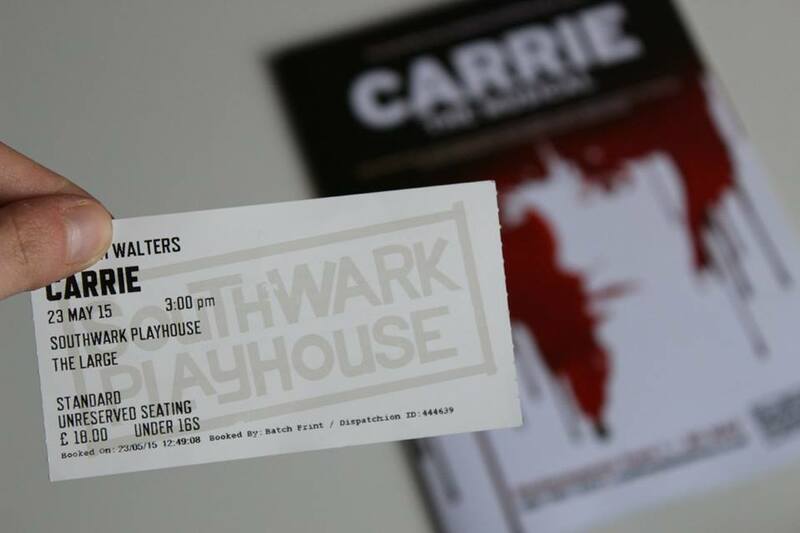 After all of the exam madness was over, I went to see Carrie the Musical in London. It was in a relatively small theatre in Elephant and Castle, and only ran for a couple of months, but it definitely deserves to come back! It was eerie and gory and fantastic. This month was so exciting. In the first two weeks, I had my first ever work experience placement at a publishing company. I got to work with some fantastic, inspiring people and it’s helped me in starting to decide what kind of a career I want in the future. Almost accidentally, I somehow managed to get some of the tickets to the #AskPaperTowns event in London. 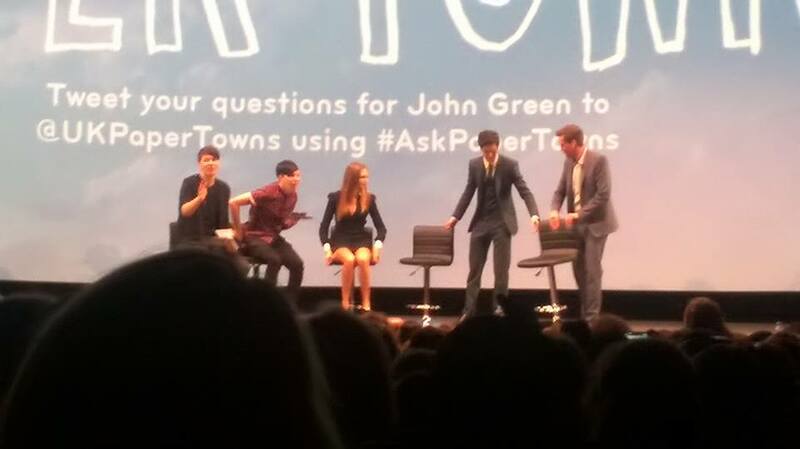 I went with my mum and a friend and it was such an unforgettable night – what was said to be a Q&A with John Green was unexpectedly also joined by Cara Delevingne and Natt Wolff – and hosted by Dan and Phil. It was such a surreal day and I also was able to meet Emma Blackery and LukeIsNotSexy, two YouTubers that I’ve loved for years! 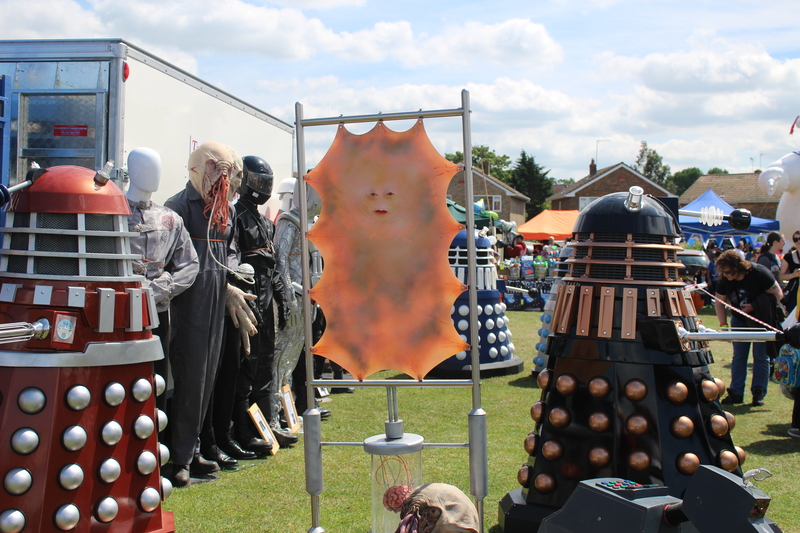 Also this month, Sci Fi by the Sea, which is fast becoming my favourite convention, was brought back to Herne Bay for its third run. It was even bigger than the last one and there was so much cool stuff there! I love seeing this convention grow every year. YALC! 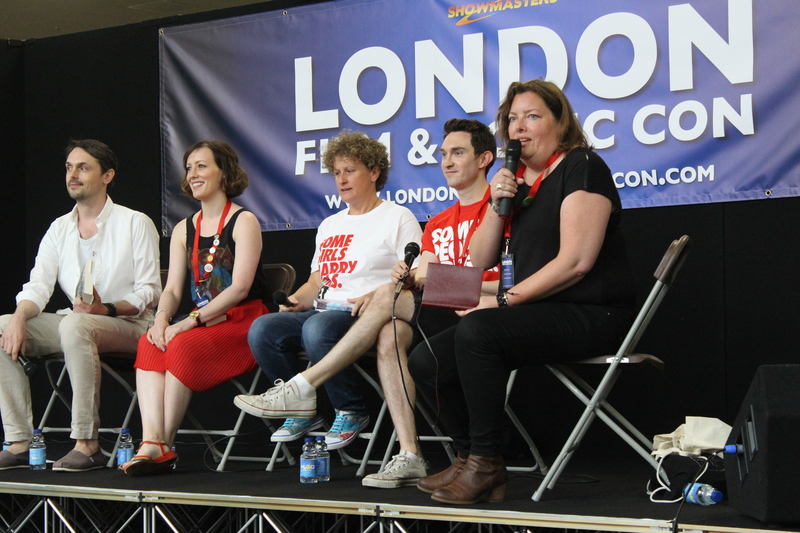 This second year was even bigger and better than the launch of this event last year – a new venue and almost a whole floor dedicated to YALC at this year’s London Film and Comic con meant so much was going on. I’m really thankful to have been invited to a blogger’s breakfast before events started on Sunday, and I had a great time in talks and workshops for the rest of the day, catching up with people and of course, buying books. One of my highlights of the day is actually one of my highlights of this year – after years of talking online, I finally met Siobhan Curham, author of True Face – she’s such a fantastic person and inspiration. At the end of July, I worked at a summer camp at my school (I did the same in 2014, but unofficially). Those two weeks were incredibly important to me, as I learned so many skills through being on the camp’s media team. I think after those two crazy weeks of photography and filmography, I’d actually like to go into a media related career! I went on one of the best trips I’ve ever been on in August – to Amsterdam. It was such an unforgettable holiday and I would love to revisit the city sometime in the future. It was fascinating to see Van Gogh paintings in person and visit Anne Frank’s house. And, looking back on it, it’s quite laughable how long I dragged my family around for looking for the TFiOS Bench. There’s a bookish recap of my trip on this blog, and a photos on my photography blog here and here. 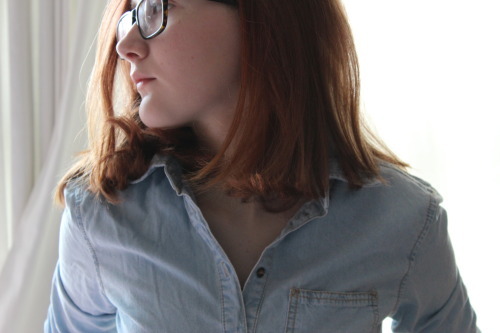 Oh, yep, and I made a new blog! It’s called geetakesphotos and it was created when I realised I wanted a place to document my everyday happenings, and adventures, that wasn’t a neglected hard drive. I bought a DSLR with my first Saturday job wages in June and I am loving getting into photography, and sharing it all publicly on my new blog. I’d love it if you could check it out! After Amsterdam, I spent the rest of my Summer preparing for year eleven (translation: sleeping) and volunteering at my local library for a second year. I love working there so much, as it’s so rewarding to be a part of the process that awards children for improving their reading and encouraging their love for it! November was full of mock exams. I also took my early entry English Language GCSE. It was even scarier than all the exams I did in May put together, because it’s one of the subjects I really want an A in, especially if I’m doing English at A Level. My mock exam results for English Language were a bit up and down, so I’m just crossing my fingers until I found out how I did in January! I also went to my first concert this month (the same day as said English exam – I’ve never been so tired, but it was worth it). 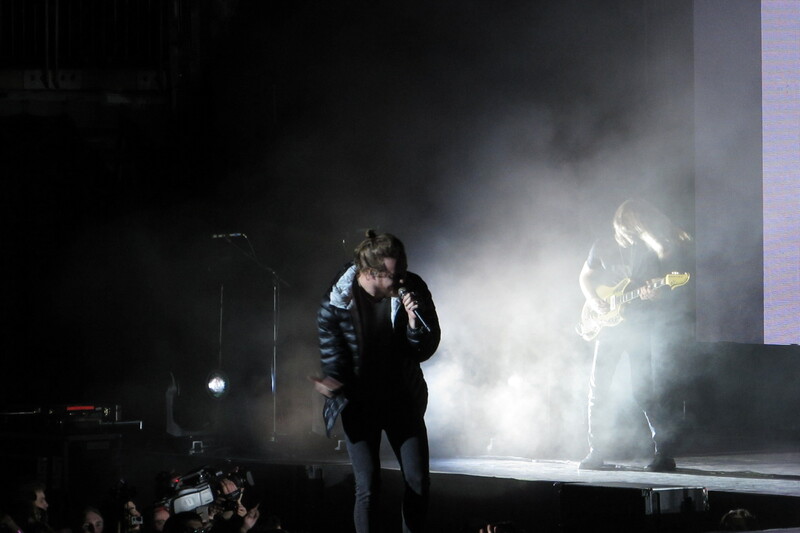 Seeing Imagine Dragons and Sunset Sons live was such a cool experience, and they were fantastic first concert choice. I’m so grateful to have been able to go. There’s a recap about it on my photography blog! And, finally… I started applying to Sixth Forms. That’s scary. I’m really excited for whatever place I ultimately receive, because I’ll finally be studying just the subjects I enjoy. I can’t get over how cool it’s going to be to actually learn about films and/or photography for real classes very soon! Thank you, as always, to all of the publishers and authors who send me books to review and give me great advice about the industry. Although there’s been a bit of a lull in reviewing on this blog lately (year eleven madness) I’m hoping to pick up my old blogging habits again in 2016. Watch this space next week for a similar blog post, about my top reads of the year – I’m also going to be sharing some of my other favourite discoveries of 2015. This entry was posted in Uncategorized and tagged 2015, 2015 HIGHLIGHTS, 2015 in words and pictures, books, events, summary, travelling, YA on December 23, 2015 by Gee. A lot of people seemed to love Paragraphs to Pictures, a blog post I published a few weeks ago on the YA books I’d love to see adapted as graphic novels. So, here’s a follow up post – this time, I’m looking at some books I would love to see on the big screen! I’m normally team The Book Was Better when it comes to adaptations of books I love – take City of Bones, Stormbreaker or Harry Potter for instance – some of the increasing number of YA novels that have been brought to the screen. As brilliant as the films are, there’s always something more magical about reading the printed word and imagining the scenarios in your head. I went to see Paper Towns a few weeks ago. I loved the book and it may be my favourite John Green novel – but the movie was unexpectedly maybe even better than the book. I thought the cinematography was perfect – scenes such as Q and Margo driving around the town at night captured beautifully. I think the story was translated fantastically. It got me thinking about other YA books that I love and treasure. What if these works were brought to big screens? Who would I pick to play characters, or direct the film? Here’s a list of some titles I think would be brilliant on screens. As soon as I put down All of the Above, I wanted to pick it up again. It’s a beautifully messy book, capturing the life of a teenager flawlessly. There’s lots of scenes I imagined so realistically in my head – I’ve never really envisioned a book’s setting so in-depth as I did with All of the Above! There’s potential for lots of beautifully shot scenes in the crazy golf course at night, where Toria and the crowd she falls in with hang out. Polly would totally be played by Cara Delevingne, as Cara has that crazy-awesome personality. I am obsessed with a TV show called Orphan Black at the moment, which is about a woman called Sarah Manning, who finds herself falling into a dangerous spiral of events when she discovers she is a clone. The actress, Tatiana Maslany, portrays lots of different clones and it’s amazing. I was watching Orphan Black around the time I read The Next Together, and my thoughts while reading were often about how riveting a film of this book would be. Not only because the plot is constructed so well, and the different eras would be so cool to stitch together in a movie, but like Orphan Black, the same two actors would be portraying many different versions of themselves. It would be awesome. This book was one of the most epic fantasties I’ve read in a long time. It was fast-paced, gripping, and didn’t want to be put down for a second. I adored the characters and the writing evoked so much imagery for me. I couldn’t stop imagining the Empire in my head, how it would look and feel. I have a feeling Peter Jackson would be a pretty good choice as director / producer, as he’s fantastic at creating beautifully detailed alternate worlds – he did a stunning job with the world of The Lord of the Rings. All These Things I’ve Done is a dystopian novel where chocolate is illegal and the main character is part of a famed family that sells it. It’s so hard to describe (I recommend it to people all the time, but there’s no way to put its brilliance into words!) but it’s gritty, emotional and captivating. Anya Balanchine is one of my all-time favourite protagonists and she would be so cool on a big screen. The setting would be quite interesting to depict in a different medium, too, as it’s 2083 New York with a mafia undertones. So, there’s my choices! What would yours be? This entry was posted in Uncategorized and tagged benjamin alire saenz, book blog, book blogging, books, film, film adaptations, gabrielle zevin, james dawson, lauren james, movie adaptations, reading, sabaa tahir, ukya, usya, YA, ya fiction on November 25, 2015 by keithbwalters. Published September 2015 by Faber. Goodreads Synopsis: It’s the summer holidays and Flora has gone off with Dad to the exotic set of his new film and Mum is at home having a much-needed rest with baby Pumpkin. Bluebell, Twig and Jas have been sent to stay with Grandma at Horsehill in the countryside. My Review: I’ve been a fan of Natasha Farrant since the first book in this series, After Iris – so I was really excited when I was offered the chance to review the third title, especially as it’s being published in the new cover style that the whole series is being re-modelled with. Isn’t it pretty?! Like the previous two books in the series, All About Pumpkin is half transcripts from Bluebell’s filming, and half diary entry. I love the format so much, and I always say that when I’m talking about these books – I just think it’s such a good idea, and Farrant writes both formats so brilliantly! The film transcripts are so much fun, and always very witty. In this instalment of the series, the latest member of the family, Pumpkin, has been born – and he’s taking up everybody’s time. Bluebell’s dad and eldest sister are in New Zealand, and unable to cope, her mum sends her and her younger siblings off to their grandma’s so she can cope with just the new baby – but inevitably, being the Gadsby family, things always end up going a little wrong. I honestly can’t find the words to describe how much I love the Gadsby family, and these books – each one has a completely fresh-feeling, fun plot. Natasha Farrant is leading the way in children’s fiction – her books are so entertaining, and I love escaping into the fictional family’s antics for a while so much. Although the Bluebell Gadsby books have their fair share of emotional bits, there’s an equal amount of hilarious moments – Farrant has got the balance of the two perfect. I also really enjoyed the way that Farrant explored the Gadsby family in All About Pumpkin, as I feel like it put a lot of focus on the younger siblings, like Jasmine, who is so loveable. Overall, I really enjoyed All About Pumpkin – it was actually the one book that managed to get me out of a month-long reading slump! It’s such a joy to revisit these characters, and I’m really looking forward to the next in the series – they feel like such timeless classics and I love to read them no matter what mood I’m in. I really recommend All About Pumpkin, and all three books so far if you haven’t tried them yet – as they’re just such fantastic reads, no matter what genre or age category you usually might stick to. 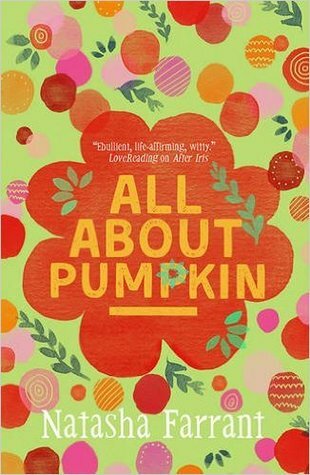 I received a copy of All About Pumpkin from the publisher, in exchange for a review. In no way at all did this affect my thoughts. This entry was posted in Uncategorized and tagged all about pumpkin, book recommendation, book review, books, contemporary, drama, family, love, mg fiction, middle grade fiction, natasha farrant, ukya, ya ficton on October 28, 2015 by keithbwalters. I haven’t made an infographic in a while, so I picked a random topic and played around a bit on my favourite graphics creator – enjoy! Open the image in a new tab for a better quality. This entry was posted in Uncategorized and tagged between the lines, books, fiction, infographic, inkheart, mr penumbra's 24 hour bookstore, reading, the unwritten on October 7, 2015 by keithbwalters.